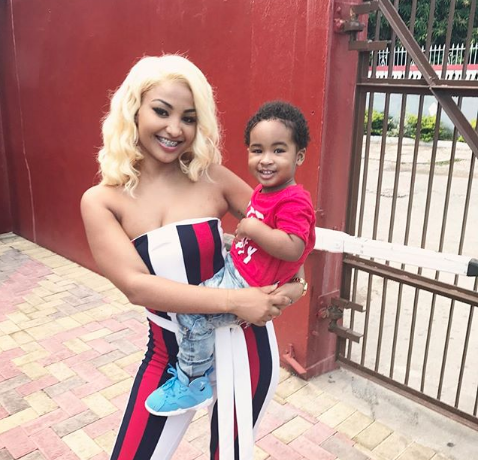 A slew of Dancehall fans have been photoshopping images with Shenseea since the start of the year. The cute and often times creepy trend got the attention of the “Love I Got For U” singer who launched a challenge highlighting the photo editing skills last month. However one fan pushed the limit over the weekend when he photoshopped an image with her son Rajeiro. “So a @thereal_rajeiro Father this?? A so unu did stay?? ?,” Shenseea questioned. “Me need a Paternity test 😂😂🤣🤣🤣🤣🤣🤣🤣🤣y’all better be glad I have a mad sense of humor! 🤣🤣🤣😂🤣🤣😂 you people are so CRAZYYYYYYY!!! Wellp!!! Happy Mothers Day from my family I guess 😂🤷🏻‍♀️🤷🏻‍♀️🤷🏻‍♀️,” she added. Luckily Shenseea is a good trooper or things could’ve gotten ugly. View photo and comments below.